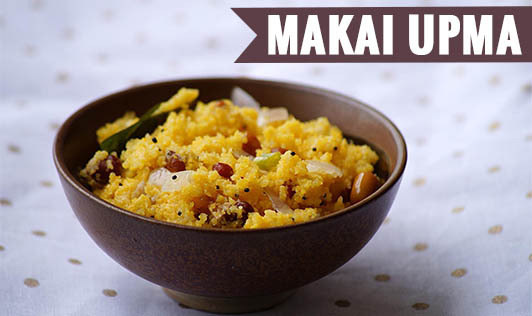 Makai upma is a sweet and spicy recipe made from fresh tender corn and Indian spices. You can have this yummy recipe in your breakfast as well as snacks. 1. Blenderize corn in a mixer and keep it aside. 2. Heat oil in a pan, add mustard, cumin, green chilies, curry leaves and let it splutter. 3. Add hing, vegetables and corn and cook for 2 minutes. 4. Now add milk, sugar and salt and cook for 5-10 minutes. 5. Lastly, add lemon juice and mix well. • You can use normal corn instead of sweet corn. • Add salt at the end to avoid splitting of milk. • You can add boiled sprouts to increase protein further.